Last night I went to bed praying my husband and I would find a baby to adopt. For seven plus years prior to that, I had prayed to get pregnant. We just decided this week to take the first steps toward adoption, and I have to say, that it has been a week of resolution for me, because even last week, I was wrestling with the inevitable. I wanted a baby, but was still mourning the idea that I would never get to see what our biological babies would look like, what it would feel like to find out, to carry the baby, to give birth, to breastfeed… Could I give up all those feelings of loss and move onward to the of adoption “solution” (as it’s often inaccurately described), and be happy? So how did I change my mind in the span of a week? I didn’t. I just came to realize, that being infertile, I will never experience those things, but the largest part of the mourning is the idea of not being a mom. Ultimately that is what it all comes down to for me. All this time I’ve been focusing on the smallest (although hugely important and meaningful), part of motherhood that I was being denied. The pregnancy and all that goes with it, lasts nine months. But being a mother lasts a lifetime. And that part I can still have. Nothing can deny me that part if I want it. And I do. I know I will always miss the babies that we were never able to have and all the experiences that come with bringing them into the world. If I tried to suppress those feelings, adopting a baby would just be a bandaid, and not a true joy. And my husband, my heart and my future baby deserve more than that. And that’s not to say that thoughts of maybe I’ll be one of the miraculous few who conceive after choosing adoption hasn’t crossed my mind. I don’t think that hopeful part of you can ever be quashed, no matter how dismal things have become. Even after more than seven years, despite being re-programmed to believe I would never get pregnant, there was always that glimmer of hope when my cycle would show signs of a miniscule change. Only to be disappointed yet again. I don’t believe my heart will ever give up on filling that void. But for the first time, I am countering that sadness, with greater feelings of excitement and anticipation at where this journey will take us. It’s been a long time since I could be happy about anything baby related. And although I know it may be a while still before we get to call ourselves Mom and Dad, at least this time I know it will happen. As a battle-scarred veteran of years of unsuccessful infertililty treatment, I have been in your shoes. 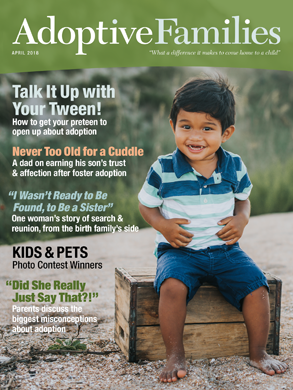 And the best statement I have ever heard about where you are: Adoption works. I’m here to repeat your last line, It will happen. And if you and your husband have survived the past seven years, you have developed coping skills and strategies that have strengthened your bond. Which is good, because you’ll need them. I read once that infertility is like a hole that always remains in your heart. But being parent to two wonderful kids has helped heal my family. You are on your way. I too, went through failed infertility and years of trying to find out baby. After you hold the baby you are meant to have in your arms, you will see EVEN MORE than you do now, that having a biological child is not the most important thing…. but having a child is. My husband and I have both commented to each other and to our families and friends that we do not see how we could love a biological child anymore than we love our daughter! My sister is currently pregnant with her first child, and her baby is due a day after my daughter’s birthday! At first, I was bitter because it brought those feelings of “we’ll never get to experience this together, see what our baby looks like, etc., again - a chapter I had closed in my heart and life. But then I realized, our daughter is perfect, and she was chosen by God for us, specifically, and I am so thankful. Congrats to you for taking the steps towards adoption. There will be many twists and turns in the process, but NEVER GIVE UP! You WILL find your precious baby, and it will be the baby you were meant to have all along. Good for you! Everyone who comes to adoption finds it in their own way and at their own time, but I have never met someone who has regretted their adoption. And though pregnancy may not be in the cards for you, breastfeeding can still happen. We have a group for it here on AFC: Adoptive Breastfeeding should you decide that’s something you’re up for. Best of luck to you, and may the child you’re meant to have find you swiftly. Hi! When I read your post earlier today I felt emotional, and can understand what you have gone through as many of us here do and can really relate to what you�ve shared. We experienced infertility for about 5 years before deciding to adopt, and went through several of the beginning treatments. When faced with IVF as our next option, we almost tried it but the timing ended up not being right for me with work and so I wanted to wait until a later time, and then God grew my heart for adoption instead. I understand what you mean about always missing the babies you were never able to have, I think I probably always will miss that a little too For me I think the experience of being pregnant would have been wonderful to experience once, but the part that I think was more significant to me was the biological connection. That didn�t matter at all for my husband, I think he mostly wanted that for me. I think I�ve had a bit of a unique desire for that, because of being an adoptee. I think it�s mostly about my children�s extra connection to me, rather than the other way around (although I too have thought about the biological connection in looks, and also still feel pangs when others get pregnant). I think that�s a normal thing for some adoptive parents to still feel and think about (I also felt like I never wanted to give up on the possibility of getting pregnant too), and think it�s good to be honest as you said because it has nothing to do with deeply loving the children you are blessed with by adoption, and I do love my two precious daughters that God blessed us with very much. I wanted to adopt rather than pursue more infertility because I wanted to have a baby and be a mommy, and that was and is more important to me than the things I haven�t experienced in motherhood. I remember my mom saying to me (my adoptive mom) how hearing the words �Mommy� were so special to her, and I can say that is the same for me, and when my little daughters call me Mommy and Mama it can melt my heart. So congratulations on your decision to adopt and I wish you many blessings as I have experienced, both from my own mom�s love and from loving and being loved by my daughters. Everyone comes to adoption in their own way and in their own time. My husband and I tried on our own and could never conceive. We both got tested and discovered that my husband was infertile. We had to mourn the loss of biological children who were a mixture of the two of us. Once we accepted that a pregnancy was not in the future for us in the traditional sense we decided to pursue conceiving with donor sperm. We did 6 IUI cycles and nothing. Then we moved on to IVF. We did one cycle and nothing. The doctor determined that my eggs were not going to fertilize and if we wanted to continue for a pregnancy we would need donor sperm and donor eggs. I really struggled with the idea of not having a pregnancy. I did not care about the biology. We had grieved that already. We decided not to pursue donor eggs. Adoption was the way we were going to create our family. It was hard to accept the idea of no pregnancy and I spent many nights crying myself to sleep. All of that being said I am so glad that we chose adoption. We have an amazing 7 month old son who was definitely meant to be with us. I thank God everyday for sending him to us. I would not take back any of our choices along the way because they brought us to him. A huge thanks to all of you! Everyone I know that’s gone on this journey has ended up with children through fertility treatments, so hearing your stories really helps. I also don’t know anyone who has adopted, so it’s great hearing from all of you who have. Annie & Colorado Mama- thanks so much for your support and kind words. It means a lot to be able to come on here and find people who understand. Double R- Yes, between this, and some other medical issues my husband and I have experienced in the past few years, I know we’ll definitely make it through the adoption waiting game. It won’t make the wait any easier (feel like we’ve waited long enough already), but I know it won’t break us. Gabby’s Mom & Aunt Lolly- Thanks for sharing both of your stories. It just reinforces the idea that this is the right decision after all we’ve been through. And yes, I too feel this is the way it was meant to be. We’ve experienced infertility because there is a baby or babies out there that need us more. Thalas’shaya- After posting this, I actually found out about induced breast feeding and immediately texted my husband a “woohoo! i can still breastfeed” message. Lol. I hadn’t found that group yet, but I will head over there and join after this. I’m really eager to learn all I can. If we get a baby, I definitely want to try to bf. I just wanted to add after years of not getting pregnant and all those feelings, I can only thank the Universe that I never did get pregnant. If I had, we wouldn’t have the son we have now, and we can’t imagine life without him. There was someone looking out of us for sure!!!! I just keep thinking about that in exactly the context you said it. I know one day, when we have our child, I will be so grateful that my life took the path it did, and that the universe didn’t listen to my pleadings for a pregnancy. So even though I’m not there yet, I can totally relate. So happy you found the “answer” you were meant to have. This was beautifully written! I feel exactly the same. We will be sending out our profile books this week! We are so excited to get going on this journey of parenthood. Your baby is out there somewhere and I hope you find him or her soon! Thank you for writing this. I know it was written years ago, but it helped me to identify with an issue I am having now. I have a beautiful, amazing 5 month old daughter after several years of infertility and about a 3 year approval and waiting process for adoption. It was about 6 years of trying to become a mom. However, my older sister has called this week to announce her pregnancy via IUI. I was not expecting the jealousy that came along with her announcement. I still grieve in my heart for the biological child I may have had. I do believe that God has a plan though because our little Tori fits into our family perfectly and is a great deal like us in personality and looks. It is nice to know that other people have struggled with the loss of a chance to be pregnant and go through the physical changes of becoming a mom. It has been great though that I had no morning sickness and weight gain! Don’t be fooled in thinking you are going to start of completely rested - the few nights before we brought Tori home, I was too excited to sleep! Thanks again for providing a camaraderie I needed even though we may never meet.